This short film with just a few-hundred views, was made in 2007. It’s a story come pseudo-documentary made about the declining Northcross Mall here in Austin, which was a few years later replaced by yet another suburban Walmart. we are trading quality for quantity. When you trade quantity for quality, you are trading you dignity. In some ways, the main characters, somewhat “Fonzy” like represent an iconic character type, James Dean, Rebel without a cause. It’s 15-minutes, a great watch. 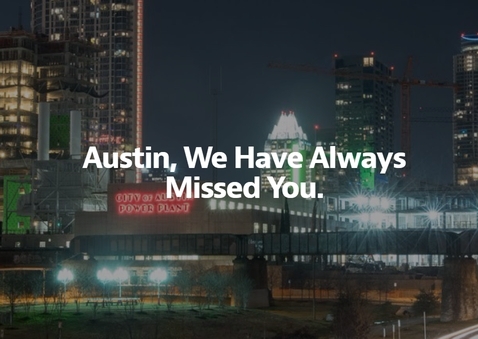 Catch the disappearing Austin before it’s gone forever. I hate that Austin is changing, but when I look at much of the change, I can’t deny that its better. This hiperstercrit blog sentiment and list of changes is one of my favorites. My poster example of change, is the house opposite mine, a 74-year old Hispanic guy lived there alone, he was so financially broke he couldn’t afford to retire; his hands were twisted and ineffective but he still did plumbing work. His only real pleasure was playing scratch cards, I’d often bump into him over at the corner store. He died last year, my neighbor and I agreed to put a bid in for his home, clean it up and modernize it, and rent it out at an affordable price using the property itself as an investment, rather than the rent as income. It was an old school south Austin shotgun duplex. His nephew was in charge of the estate wanted $450k for the house. We looked it over, inside was awful, he hadn’t done any real maintenance, decoration, or refurbishment and our contractor reckoned it would cost $150k to sort out the piller/beam, the floors, a/c, electrical etc. We offered $350k but it was refused. They sold for $420k to Sett Studios. The city applied for Historic, the neighbors all wrote in opposition to the Historic zoning, the city withdrew the application. It will likely be replaced some some variant of this, which is two doors down on the same block. So is Austin changing, do I blame people like me moving in? Yes to a point. I’m part of the problem. On the other hand, would anyone have paid the $450k and refurbished, no! Can I blame the nephew for asking a high price, absolutely not. Could you really ask someone to live in the house as it was, not really, although I’m sure some do it’s really not what we should be aiming for in the USAs fastest growing city, absolutely and totally not. This isn’t change for change sake, it’s necessary regeneration. 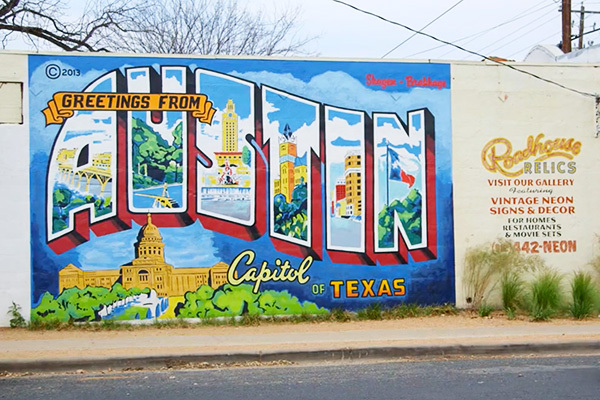 The “Welcome to Austin” mural is a perfect analogy of change. Yes, it has changed, although most won’t have noticed. Back in early 2013, I asked Todd Sanders at Road House Relics if he had any plans to repair/refurbish the mural? I introduced Todd to the folks at the neighborhood association, and contacted a personal friend who is in a senior position at the AUSTIN CONVENTION & VISITORS BUREAU, and a few months later the wall was stripped, and perfectly repainted by a team from Creative Action. It’s new, it’s vibrant, the only way you can spot the change, the new mural says (C) 2013 top-left. Change is inevitable. So, it’s formally announced, Google Fiber is coming to Austin in 2014. This is potentially a great announcement. The focus will be on the speed, which in my view is wrong. It should be on the affordability and open access. For the most part, as I’ve blogged numerous times, Time Warner Cable is more than fast enough for most homes, its just uncompetitively priced for most, and not affordable for many. I’ll be especially interested to see how they do this, right down to if they lay new cables underground, using existing or new carrier pipes; hopefully it wont just be more optical cable strung between poles. Obviously what will also bet interesting is the plan, which neighborhoods first etc. The devil is in the detail though, here are some of my first thoughts on it. When and if it arrives in the ’04, it will come with a bunch of infrastructure that will require users to give up more data on themselves and what they do, what sites they visit etc. How much should google know about you? On the plus side its competition for TWC, which if you’ve been following along, is what I’ve been campaigning for, writing letters, making calls. They have a free offering. How this is used, who it is made available too is key; with more and more services going online we can’t afford a class of citizens who are denied access. Should we look for ways to subsidize the install/sign-up fee? If they just string fiber optic cable between existing polls, boooo. On the other hand, if they do it right and runs the optical fiber(glass cable) underground, are you ok with them digging up the streets. I am. We need to get all the cables underground to improve service, reduce maintenance costs, and get rid of the visual mess it creates. If you just have a one or two wireless devices, you are unlikely to notice the speed-up, and thats OK. Sure there are new standards that will enable a wireless device connect to the Internet at a theoretical speed that matches your Internet connection, as others have pointed out, Wireless N can already exceed the basic TWC services. Except for multiple people gaming, a couple of HD movies streaming though, you’ll be hard pushed in most homes to notice the difference. It’s no coincidence then AT&T, apparently smarting from the widely leaked google announcement, I can’t even get their service on my urban, less than a mile from city hall street, despite the fact they have two poles and cables on my block, responded by saying “we invest more than any other public company.”. Not here you didn’t. After some procrastination, most due to the real/actual lack of choice, today I cancelled my Time Warner Cable “All the best” subscription and switched to just Internet only. I’m replacing the TV part of the subscription with DISH network, using their Dish America package. At least according to Time Warner Cable, my Internet will cost $62.10 for the Turbo Internet service, which is what I have now, and claims “Up to 20Mbps” download and “Upload speeds up to 2Mbps”. Once all the change is done, I’ll likely upgrade this to Extreme if the prices are as TWC say they are. I have to get an cable modem to save another $3 per month. versus my new TWC monthly bill of $202.70. The difference of $90.30 will be more than enough to pay for an unlimited data plan with tethering and wireless hotspot with t-mobile, which makes up for a basic TWC Home Phone service. Again, once all this is settled down, I’ll use set-up my Google Voice number as a home phone. The final step will be to replace my Time Warner Cable Internet service. Currently there are no practical alternatives for my house in south central Austin. Frankly this lack of competition is appalling, in what is claimed to be one of Americas high tech cities, and allows Time Warner Cable to exist as a complete monopoly. When the TWC Sales rep was trying to work a deal and keep me as an “All the best” customer, she repeatedly kept saying “I know you are working to a budget”, to which I’d say “No I am not, I can afford to pay for this, I just won’t, your services are good but just over priced”, she either didn’t get it, or her script didn’t have a response path. Tomorrow starts the annual rush and crush better known as South by South West (SXSW). Most of the official events don’t actually start in zipcode 78704, but it’s one where it is possibly most noticeable. With South Congress, Auditorium shores, the “Mexican mile” on South First, and lots of new restaurants and alternative destinations in the ‘hood, like Slackerville and plenty of retro and vintage shops hustling for attention, there are bound to be many official and more unofficial events [End of an Ear has 8-bands alone]. Threadgills[South] also in the ’04 has a massive lineup of musicians running from Wednesday through Saturday. Someone missing from the scene will be Austins’ close held but now passed Leslie, My neighborhood was certainly made special as he regularly hung out on the front porch of La Mexicana bakery and Flashback vintage. There’s already been an outpouring on Facebook of people saying Austin won’t be the same without him, and it sure won’t. He was found on Feb 16th, unconscious in a parking lot across the street from my house. I wasn’t involved in his rescue this time. I did sit with him once though when he’d collapsed for some unknown reason in the Twin Oaks library parking lot, while I waited for the South Austin Medical center to dispatch a free ride to come collect him. Then there was the Sunday morning when I jogged past him at the bus stop on South 5th and W Mary, again apparently passed out, legs akimbo, wearing a short skirt with his less vital organs in clear display. I ran 3-blocks south before deciding to come back and check on him, yep he was “asleep” and after a few minutes it was clear an ambulance wasn’t required. Yep, it’s a shame he’s gone, no one deserved to be treated like he was when he was beaten up, and Leslie was afforded some great friends like Debbie Russell and many others. 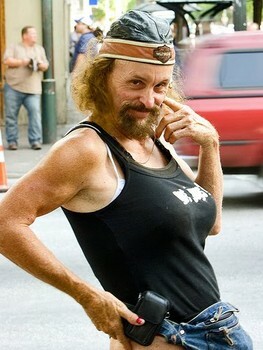 Lesie was though much more than a cross dresser to entertain people on S. Congress and Sixth St. and people should remember that when mourning his passing. And Austin will be just the same without him, there are lots of other people keeping Austin and the ’04 weird. Just take a trip down to Eeyore’s Birthday Party and you’ll see the spirit in full flow, and that doesn’t include some of the more esoteric and fantasy characters like The Bandit Queen of Lady Bird Lake. Welcome to the ’04 to all the SXSW visitors, we are all here, because we are not all there.